How do you overcome a fear of the unknown in order to reach your goals? 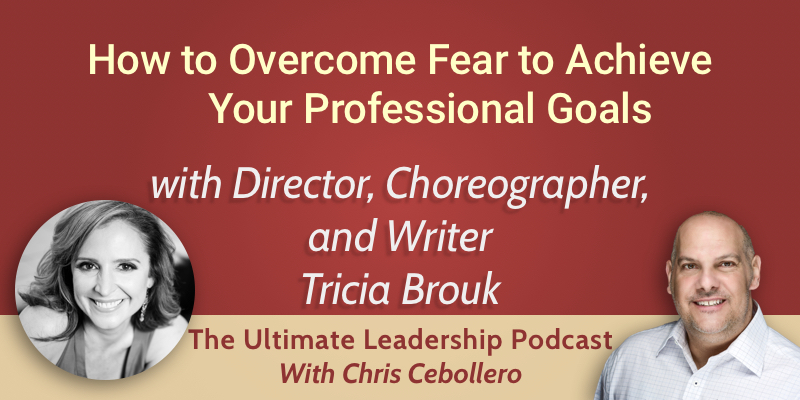 After moving to New York city at the age of 20 to pursue a dance career, Tricia Brouk was faced with many obstacles while she was following her dream. She talks to us about embracing fear, rather than dwelling on it, and how using this technique has helped her success. Tricia tells us about starting her second company, The Big Talk, and shares tips with us on how to put a plan together to reach your goals and how to manage fear within your career growth. Tricia has rephrased ‘overcoming fear’ to ‘embracing fear’. She tells us that if you embrace the fear you feel about achieving your goals, it will make your ability to believe you can do it stronger. When Tricia started her first company, her trick to succeeding was by not having fear of failing. She didn’t feel fear and dwell on it, she just did it. Tricia had the mindset of “If I failed, I would try again”. When you have a goal that you want to reach, the first thing to consider is whether or not you are prepared for it. Have you done your homework? Have you researched? Are you really ready to take it to the next level? Tricia says that once you have considered this, and if you feel that you are ready, then you need to just do it. If you make a mistake along the way, ask for help. If you don’t know how to do something, ask someone who does. There are things within Tricia’s business which she doesn’t know how to do, such as embedding code, so has made sure she’s hired the right people to help her reach her business goals. In the last year, Tricia has discovered the power of social media in promoting her business The Big Talk. Tricia only uses social media for business but was shocked at how people many people are driven to these platforms to promote and to connect. If you’re scared of using social media for your business, let go of the fear. The power of social media exists, and you need to take advantage of it to market your business. On social media, you won’t please everyone all of the time. But if your message is consistent and you use it in a positive way for your business, it will serve you well. You don’t have to use all of the social media platforms for success. Use a few which you love, and use them well to see amazing results. Tricia started directing Tedx talks and realised there was a need to help public speakers to identify their craft and deliver signature talks. From this, she created The Big Talk to help clients to become more comfortable with writing and speaking. She then applied for her own TEDx licence, and TedxLincolnSquare was born. When asked about leadership, Tricia tells us that she always felt like she wanted to help people, and believes she can lead people to see the best of who they can be as she is a natural leader herself. The first step to overcoming the fear of public speaking is to acknowledge that you have fear. Know that it’s there and allow it to be there, but try not to get attached to it. Tricia says that you have to rehearse your speech so that when the fear comes you don’t fall apart. Knowing that it’s there, and recognising it when it comes means that you can let it go. If you make it about you and you make fear control you, your message won’t be heard by the audience. Your message is a gift to the audience, so it’s important to be well-rehearsed and ready to recognise and let go of the fear when it comes. Tricia’s big tip for managing fear and continuing your success is to show up every day. Connecting to everyone you’re working with will help you to maintain and manage success. You don’t know what tomorrow will bring, so put yourself out there and pick yourself back up if you do fail. Every day has to be about being truthful, authentic, making a difference, and being who you are, not who other people want you to be.